How it is that 'Highest Wisdom' is a characteristic of the One Being? As envisioned here, the Void and the One Being are the unmanifested and manifested counterparts of each other. Void consciousness is the substance of space, which is the medium for all motion (the One Being.) The Void is also the highest intelligence in that it contains the most complete perspective. The One Being bridges the human soul to Void consciousness. Highest wisdom combines intelligence with essence, that is, frequencies which support lofty human qualities such as compassion and selfless service. How can the Non-specific Void also be the Present Moment and the Substance of Space? The Present Moment is nowhere on a timeline. The Substance of Space has no coordinates. They are also one and the same on all dimensions. It is the same Present Moment in every dimension. The Substance of Space is the same space in all universes. How can the Void be the highest intelligence and have the most complete perspective? This naturally leads us to the conclusion that the very existence of a particle has strong relation or is intimately linked with its motion in that many of them will cease to exist or would not even form otherwise. The phenomenon of perpetual motion is not restricted to the structure of atom alone. The same principle can be observed in the rotation of the sun and the planets on their axes on the one hand, and in the orbital paths that the planets take round the sun, on the other. This truly gives the impression that motion has definite ‘intelligent programs’ causing it and ensuring that electrons are not caught by or ‘pulled’ into the nucleus, yet stay trapped within the atom. Now imagine what would happen if electrons failed to repel each other by changing direction of motion, and if the protons behaved in a similar manner? What would have happened if hydrogen and helium atoms failed to form? No galaxy… no planetary system… and no life on it. It implies the presence of a form of ‘intelligence’ within the phenomenon of motion itself. The Void is the medium in which ALL motion occurs, from the spin of a particle to the expanding spiral of a galaxy. Without the medium, there would be no motion. The same Substance of Space is in all, and encompassing all, and it is one. It is the same space – unmanifest and manifest. To bring that abstraction into practical application, merge with the moment. It is simple but not necessarily easy. 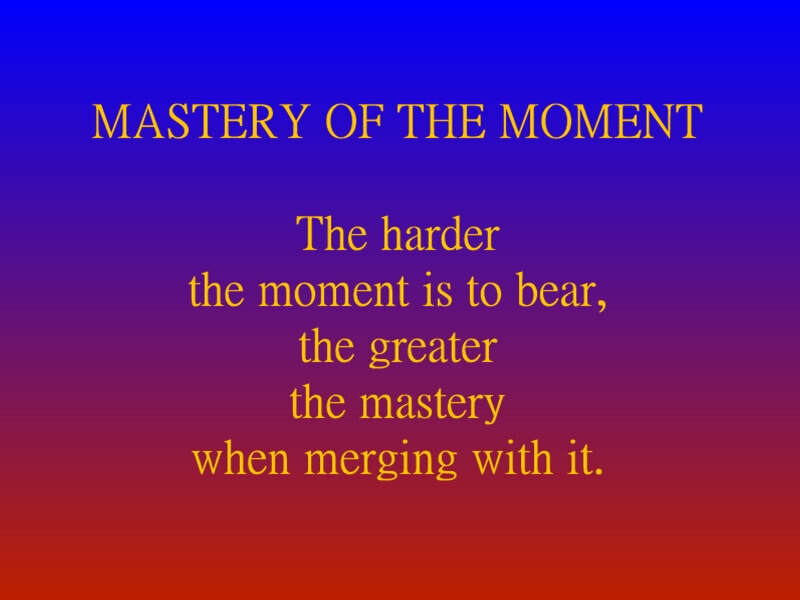 Why merge with the moment? For one, it dissolves resistance. When I am not resisting life, I am more alive. For another, when I merge personality with the Present Moment, I also merge with the Non-specific Void and the Substance of Space. What could be more spacious and expansive? How can there be merging when we are already one with every moment? It depends on who we mean by 'we.' 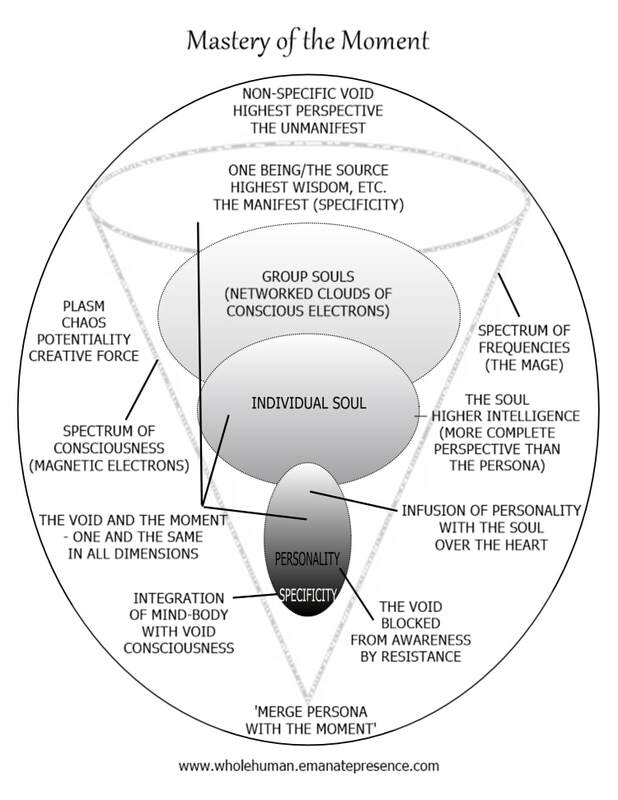 Looking at the diagram above, Void consciousness (oneness) extends from the persona through the individual soul and group soul to the Void. Even in the most separated persona there is a seed of the Void. It must be, as the Void is the substance of space. However, in the awareness of the awakening persona, there appears to be separation. How many humans actually live as though they are merged with the moment? Very few. If it were not so, there would be no resistance in humans to anything. If a person still cringes or reacts at times, is defensive or critical, or acts on any 'separated' thought or emotion, they are not feeling one with the moment! Have you ever laid back into a body of water, trusting it will hold you up, let go of mental control and floated blissfully in its liquid embrace? That is something of the feeling which arises when I let go of controlling thoughts and emotions and yield to the body of consciousness, the substance of space, the higher intelligence, which I call the unmanifest non-specific Void and its counterpart, the manifest One Being. Letting go of mental control does not mean letting go of command of one's body-mind. It is not escape from life, but engagement with it to the extent of merging with whatever is at hand. When combined with yielding heart and mind to the higher intelligence which is also me, this type of letting go leads to mastery of the moment. As a teenager filming a sequence of kayakers running whitewater rapids, I noted that most (young and athletic) struggled with all their might and some did not make it beyond the rocks. They resisted the rapids and crashed against the rocks. Then an older man appeared upriver around the bend, and he seemed different in his calm presence. He guided his craft through the passage as though he, the kayak and the river were one. He had mastered the moment. When my partner and I were on Maui and had come out of the rain-forest to hear Wayne Dyer speak at the university, we found ourselves in the city with no money and nowhere to sleep the night before the event. We were exhausted and felt we could go no further when we came to an opening in the brush that was alongside the street. Diving through the opening with our backpacks, we saw it was a junkyard of rusted metal parts and a ditch of stale water. I let go of resistance towards the local moment. I let go of body tension and embrace what is. I feel through the heart to the One Heart. perspective of the One Being. I trust in this Moment.